We are super thrilled to be sharing Danielle and Alex’s Catholic Wedding Day ceremony at St. Christopher’s Church in Rocky River and reception at a LaCentre in Westlake, Ohio with you all today. If ever there was a time that we had to roll with the punches, it would have been on this day. We had hoped and prayed for great weather and outdoor photos for months, but it had become quite evident by the beginning of the week that we were going to have to switch gears. On the bright side, since both Danielle and Alex are pretty down to earth and realistic people, we were able to create a solid alternate game plan within no time. It was a good thing that we did! From early that morning until the following day, the rain never stopped coming; but we had already decided that the rain wasn’t going to slow us down. 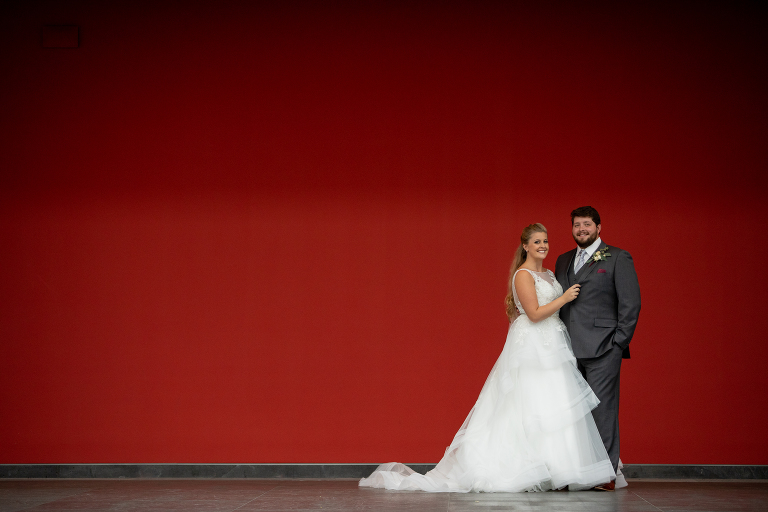 After their beautiful Catholic ceremony at St. Christopher’s Church in Rocky River, not only did we stop at the Cleveland Museum of Art and the Cleveland Public Library but we were also able to make our way over to the bar where Danielle and Alex first met, the West End Tavern. We absolutely LOVED how Danielle didn’t mind getting her gorgeous Sophia Tolli dress wet in the pouring rain for bridal portraits. It was totally worth it!!! As we headed off toward the reception venue, the rain persisted. The skies continued to become ever more gloomy and a heavy chill ran through the air; however, none of this mattered the moment we entered through the doors of LaCentre. Jessica and her team did such a spectacular job of creating a warm and cozy atmosphere with all of the vibrant earthy colors and fall décor. Danielle and Alex’s wedding was the perfect balance of the beautiful ambiance, great food and thanks to Ted and Vince from TKO Entertainment, an amazing party. No one thought twice about how cold and rainy it was outside because it was HOT on that dance floor! Danielle and Alex, the two of you were so much fun to work with and we would like to thank you again for trusting us to capture your special day. We hope that you enjoy these favorites from your day as much as we do.